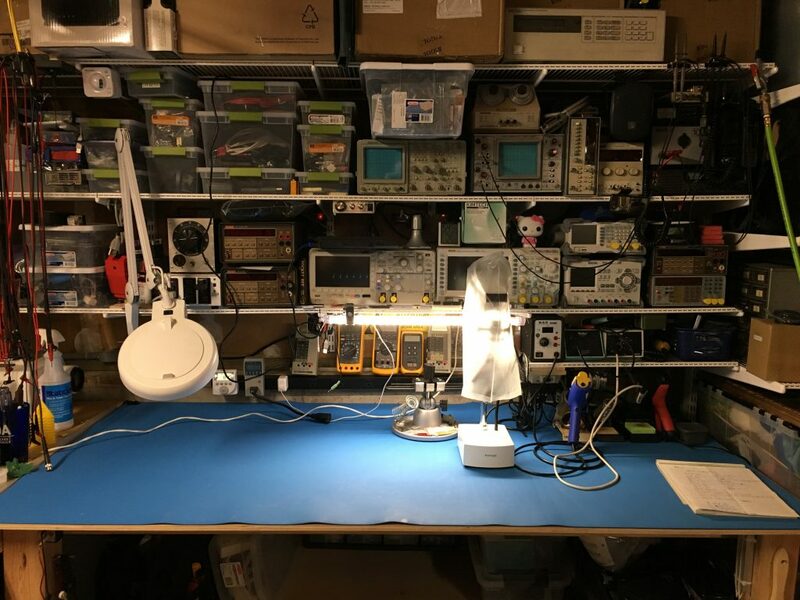 My lab at this point consists of several bench multimeters, a scope, function generator, counter, power supply (which I hope to upgrade soon), couple soldering irons, and some handheld meters, LCR meter, etc. While most of my work is doing repairs, I have done some basic design at the bench as well. Arachnid Labs Re:load Pro Small programmable DC Load. Only does about 50W continuous, but that’s fine for almost everything I need. Energy Concepts, Inc ECI 30820 Analog Scope, identical to Iwatsu SS-5702. DER (IET) DE-5000 My LCR Meter of choice (well, my only one). Works great, and quite affordable via eBay. Flir e4 (e8) Amazing Thermal Camera. Amazingly hackable, at a great price point. Fluke 12 Awesome tiny meter. May actually be my favorite go to meter now, as it autoranges EXTREMELY fast. Fluke 189 Great logging meter. Though I probably use the 87 more. Fluke 8060a I mainly have this meter for nostalgia sake, but it is an awesome meter if you have a chance to pick one up. Fluke 87 One of my two go to handheld meters. The other being the Fluke 189. Hakko 936 Go to soldering Iron. Still a workhorse after all these years. Hakko FG-100 Soldering Iron calibrator. Hakko FR-300 Amazing Desoldering Gun. Use it all the time for thru-hole work. Hakko FR-810 Amazing Hot Air Rework Station. Hakko FX-888D Basic Hakko Soldering Station. Just have the base unit so I can use with Hot Tweezer Kit. Hakko FX-951 Great Prosumer Soldering station. Amazing thermal capacity, and tip selection. Galvant Industries GPIB USB rev 4 GPIB to USB Adapter for my older multimeters. Keithley 196 I have two of these 6.5 digit bench Multimeters. Malone Electronics DMMCheck Plus Voltage, Current, Resistance, Frequency low cost calibration standard. PEAK Atlas DCA Pro (DCA75) Advanced Semiconductor Analyser with Curve Tracing. Racal Dana 1992 1.3Ghz Frequency Counter, old 80’s gear but amazingly accurate and useful. Rigol DS2072 70Mhz (hacked to 300Mhz), dual channel digital oscilloscope. Tektronix MSO2012 100Mhz, dual channel, Mixed Signal Digital Oscilloscope. Toroid Technology ISB-060W Medical Grade Isolation Transformer (International Model, Secondary Neutral not grounded. Modified to remove Isolated side ground. Trimble Trimble Thunderbolt GPSDO 10Mhz GPS Disciplined Oscillator.